easy pattern, but the hat was wwwaaaaaayyyy short. i added 4 more rows of dc after the 4-8 section. i want to make the cherry pie one. sooo cute!! 1. You pulled your dc tight causing them to be short. 2. Your choice of yarns affected the height of your stitches. 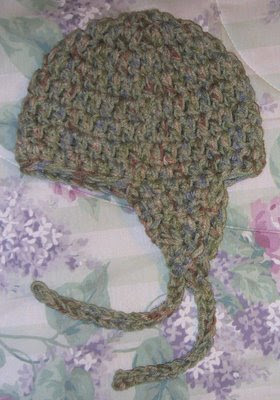 Many people have crocheted this hat without problems. It sounds as if you were able to adapt to make it work for you. I love this pattern!!! Thank you so much, I made one for my 10 year old daughter, she loves it! I had to add one more row of increse, she has a big head! I used 3 strands 2 caron simply soft and one thin shiny strand. Now my 14 year old daughter wants one! I made this out of various scraps, for my ten year old, now my MOM wants one! great pattern, easily adaptable size, thanks for posting!!! Love this pattern - so easy and quick which we all like! Thanks so much for sharing.